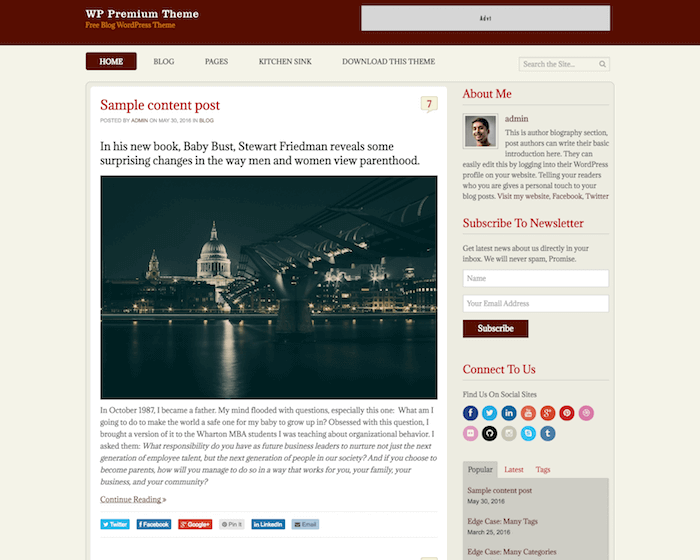 Bloger from AccessPress Themes is a free responsive WordPress blog theme designed with a simple and clean layout. This theme features a beautiful magazine-like layout, and is ideal for any personal and professional blog of any niche. Since Bloger is a magazine type theme, it can also be used for creating news websites, photography blogs, and other similar sites. 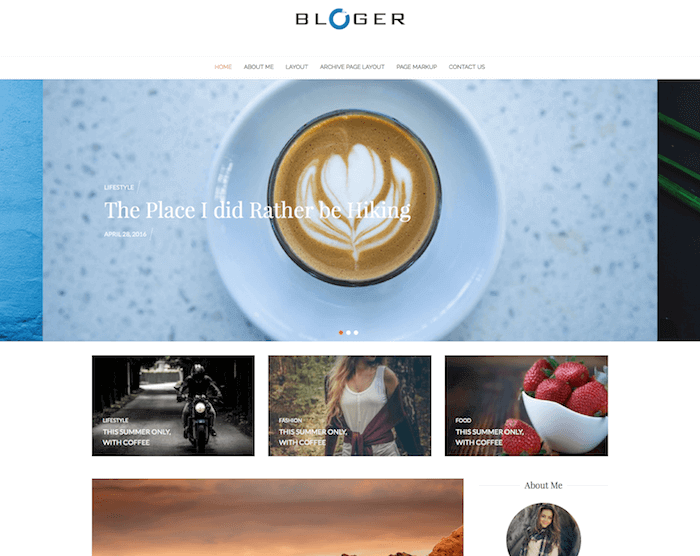 Bloger theme has been designed strictly for bloggers, and the focus has been put on the content and photographs exclusively. If you want to create a blog with a lot of photos, this is the theme for you. You can use this theme to create your next photography or travel website. Bloger is a fully featured WordPress blog theme with all the customization setting, plugins, and tools you may ever need. Although Bloger is a simple and clean theme, it also equips one of the best designs you will ever find for a blog website. 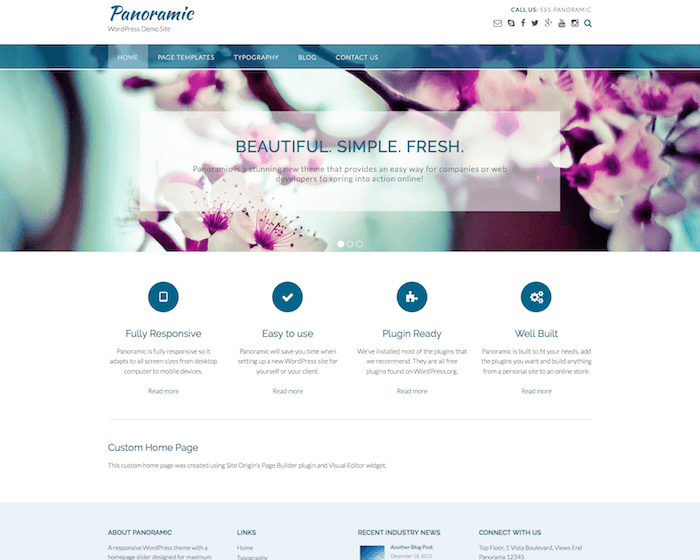 The theme features three beautiful and very stylish layouts for your website homepage. You can choose from the full-width layout with one sidebar, grid layout, and full-width layout without any sidebar. You can choose any style you want for your blog homepage, or you can experiment with different layout styles. The site itself features two different layouts, boxed and full width. There is a beautiful full-width slider present at the top of the homepage of this theme which can be enabled from the admin panel. The homepage slider is one of the first things your visitors notice on the website. It can be used to display some of your best works or most popular posts. The slider supports multiple content types, including links, images, and text. In-built slider options and customizer can be used to make necessary changes in the design and style of the slider. Pinterest is a great tool to promote photographs and posts. Bloger theme integrates the Pinterest widget in the footer that displays the latest pins from your Pinterest profile. You can customize this section to display the images you like. Bloger also supports many other social marketing tools, such as social sharing for posts, social profile linking, etc.